The sixth outreach mission under the joint Netherlands-Luxembourg MTCR Chairmanship was to Abu Dhabi on 25 May 2016. The visit marked the fourth MTCR outreach visit to the UAE. By coincidence, the first mission to the UAE, held in 2000, was led by the then Netherlands MTCR Chair. This delegation was lead by the MTCR Chair, ambassador Piet de Klerk (NL) and consisted of representatives of the MTCR Troika, the MTCR expert groups and several MTCR Partners. 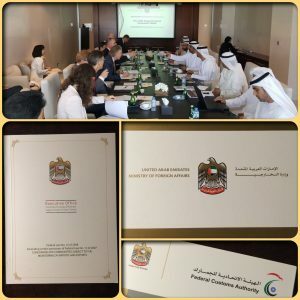 The UAE delegation represented the three main players within the Emirates that are relevant to MTCR: the Executive Office of the Committee for Goods & Materials Subjected to Import & Export Control, the Weapons Ammunition, Explosives and Military Materials Office, and the Federal Customs Authority. As part of the broader agenda for MTCR outreach the MTCR delegation provided a general overview of the Regime and briefed the UAE delegation on the work of the MTCR and its expert groups, including recent changes to the MTCR Annex, and other relevant developments. The UAE provided insightful presentations on its export control policy, licensing and customs matters. The end of the outreach programme of the joint Netherlands-Luxembourg MTCR Chairmanship is now approaching, as most of the destinations that were agreed at the 2015 MTCR Plenary have been visited.